The Right Way to Apologize - Something New Everyday! 1. Full acknowledgment of the offense. Start by describing exactly what you did wrong, without avoiding the worst truths. Once the facts are out, acknowledge that your behavior violated a moral code. It doesn't matter whether you and the person you've hurt shares the same ethics: If you've broken your own rules, you're in the wrong. Accept responsibility. 2. An explanation. A truthful explanation is your best shot at rebuilding a strong, peaceful relationship. The core-deep explanation for your behavior is your key to changing for the better. Explanations help you and your victim understand why you misbehaved and assure both of you that the offense won't recur. Excuses merely deflect responsibility. Leave them out of your apology. 4. Reparations for damage. 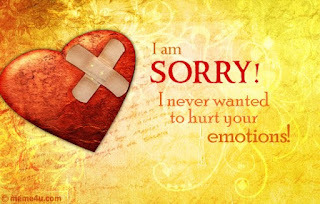 An apology includes real repair work: not just saying "I'm sorry." Often there will be nothing tangible to repair; hearts and relationships are broken more often than physical objects. In such cases, your efforts should focus on restoring the other person's dignity. The question "What else do you want me to do?" can start this process. If you ask it sincerely, really listen to the answer and act on the other party's suggestions, you'll be honoring their feelings, perspective and experience. The knowledge that one is heard and valued has incredible healing power; it can mend even seemingly irreparable wounds.